Start in the campaign for which you wish to create the report, then navigate to the "Reports" module using the navigation on the left-hand side of your screen. Then, click the "Create Report" button in the upper right hand corner of your screen. The "Create Report" wizard will appear. There are three steps to the wizard, where you'll create the title, choose the report source, and start the design respectively. First, add a title, then click "Continue". Then, decide on your source. This determines how you will start the design of your report. A blank report. This gives you a fresh design with nothing pre-configured. A report template. This lets you start from either a template that you've created or a pre-configured template that we've made available. An existing report. 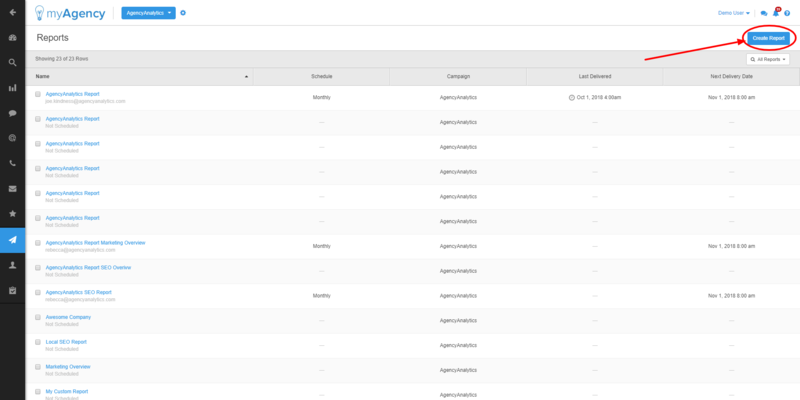 This allows you to clone an existing report from any campaign in your account as a starting point. 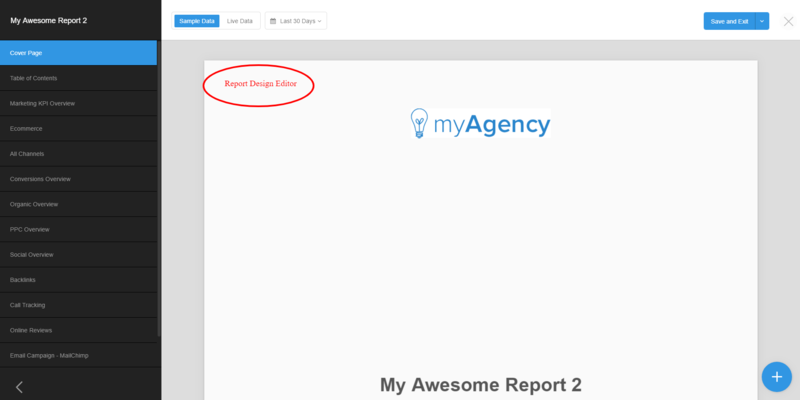 Next, design your report, adding and configuring report sections and widgets as need. See the "What's Next" section at the bottom of this article for links to articles that may help in completing your report design. When finished with your design, choose "Save & Schedule" in the "Save Menu" drop down. This will take you to the Scheduling wizard. Choose your options for each item in this screen. Date range: The time period for the report data. The date ranges available for scheduled reports will vary depending on the option that you chose in the "Send" section. Last 30 Days literally means the last 30 calendar days exactly. Previous Month means the previous calendar month. For example, regardless of whether the report is sent on July 1st or July 15th, the report will included data for the month of June. All time means all data available. Last 7 Days literally means the last 7 calendar days exactly. Previous week means the previous calendar week. For example, regardless of whether the report is sent on a Monday or on a Thursday, the report will included data for the previous week, M-Sun. Previous Day literally means the prior day on the calendar, regardless of whether the report is being sent at 1am or 11pm. Last Quarter means the most recently completed calendar quarter. "Last Quarter" reports can only be scheduled for the 1st day of each new quarter. When finished configuring "Send" options, click "Continue". You'll then move onto the "Email" section of the Scheduling wizard. 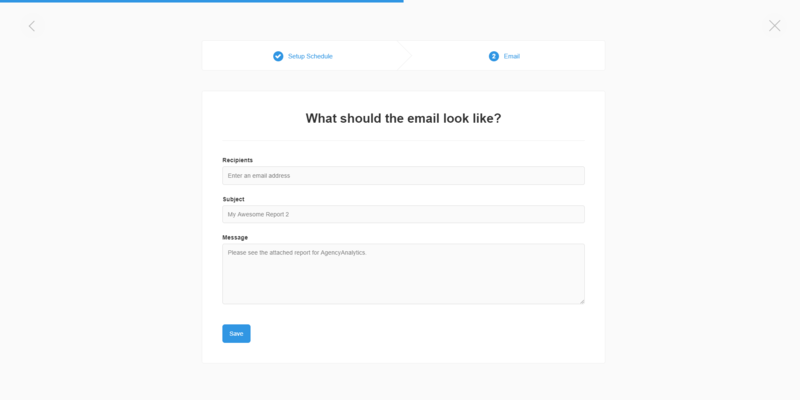 Recipients: Enter each email address to which you would like the report to be sent. Subject: Enter the subject of the automated report email. Message: Enter the message body of the automated report email. When finished, click "Save". Your report will then be scheduled per the settings that you've configured.